The UK’s industrial strategy aims to improve the performance of UK businesses, increase productivity and create good quality jobs across the country. Global demand for low carbon energy infrastructure is rising, and businesses are increasingly recognising their exposure to carbon and resource risk. 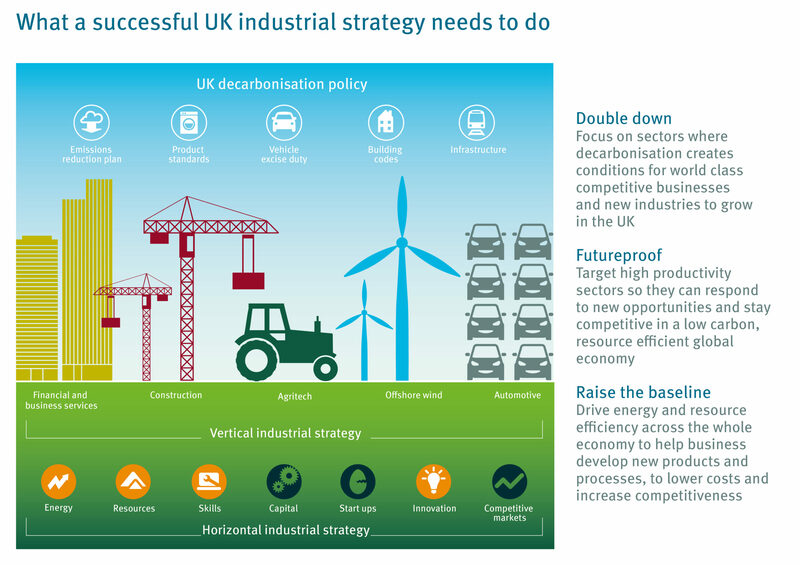 The industrial strategy will only succeed if it fosters low carbon and resource efficient growth. •Raise the baseline: to build UK manufacturing competitiveness by using product and process innovation to radically improve energy and resource efficiency. •Futureproof: to ensure that leading UK business sectors remain competitive by developing goods, services and processes that will be in high demand in a low carbon, resource efficient world. •Double down: to focus on sectors that have the potential to deliver both high productivity and decarbonisation, to foster world class new industries in the UK.